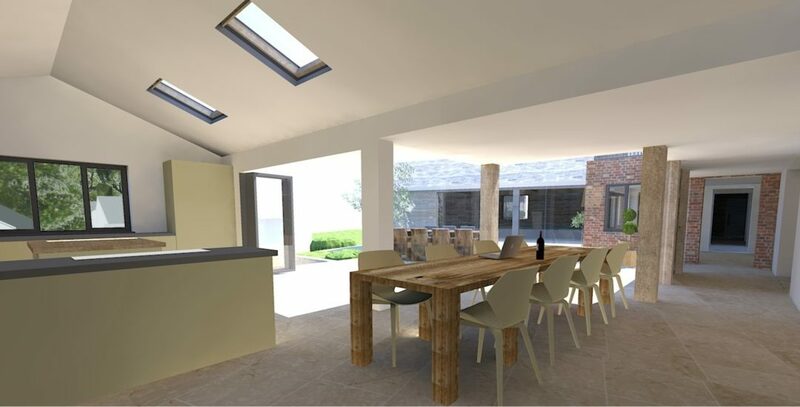 Having obtained planning permission in March 2016, the client asked us to review the design and create something that involved less excavation of the land on site. The revised proposal involves a large split level structure and a new glass link to the rear of the house. This rear corridor across the back of the house is heavily glazed and allows for the majority of the internal rooms within the house to remain unaffected. The new extension at ground floor level provides a swimming pool, sauna, wine cellar and office space and sits under a traditional pitched slate roof. A defining feature of the design is the corridor which is clad in slate internally and externally. This provides a link corridor to access the cinema room, gym, changing room and music room, which sit within a timber box structure. The project is currently on site, and is expected to complete in Spring 2018.